The TWO ways HDMI splitter / amplifier allows one HDMI devices such as Blue Ray DVD Player, Sky Box, PS3, Xbox360 etc. to be split to TWO HDMI Compatible Monitors, HDTV or Projectors. 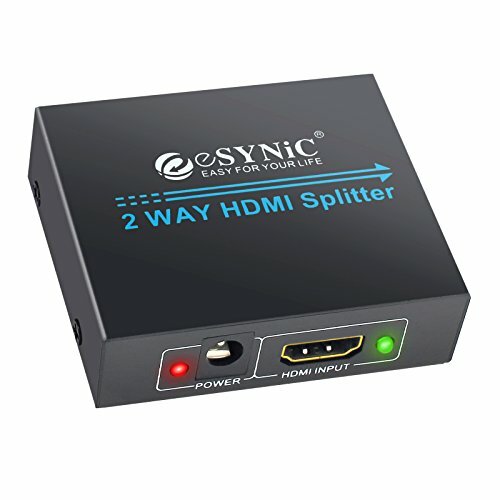 As it comes with the amplifier function, this 2 way HDMI splitter can be placed at the end of a long HDMI cable to enhance and regenerate the HDMI signal. Perfect for;3D HDTV/ SKY HD / PS3 / Xbox 360 Elite / Virgin + / Blu-ray player / DVD / HD Camcorder / HTPC / Laptop / Free satellite HD etc. Splits HDMI signal to 2 HDMI displays completely. Fully HDMI 1.3 specification compliant, 3D support. HDMI or DVI to HDMI cables used for inputs and outputs. One HD Source input, TWO Display on TV at the same time. High resolutions up to 1920x1200, including 480p,576p,720p,1080i and 1080p. Connects Two HDMI displayers at the same time to the same video source. Splite ONE HD source into TWO Displays on Two Different HD TV/ Projector simultaneously. Splite ONE HD source into 2 Displays on 2 Different HD TV/ Projector simultaneously. Some model of the SKY HD Box might NOT provide 5V power via USB port, as they have block the USB power. So we recommend buyer power it via an external USB charger such as phone USB charger.